There’s a reason why rabbits chew on a lot of grass and hay when they’re in their natural element. It’s because the fiber contained in grass hays stimulates intestinal function and helps prevent hairballs while also keeping their teeth trimmed. 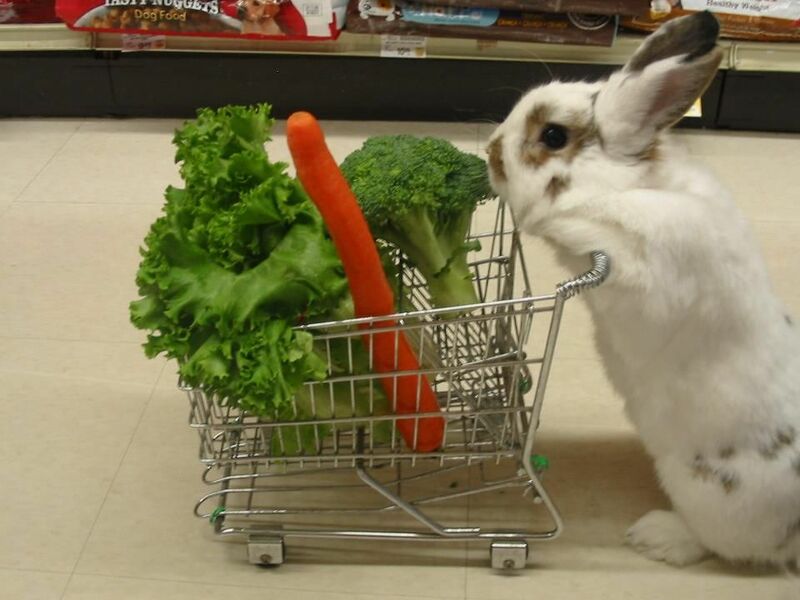 A proper diet is key to your bunny’s good health. Their digestive system and nutritional needs are very specialized, but once you know the basics it is easy to follow. A rabbit’s diet should mainly be comprised of fiber, hay should be readily available to your bun all the time. Check you local feed store for fresh and low cost bale of hay. Keeping a balanced diet comprised of hay, pellets and vegetables, should be enough for your bunny. Anything else that your rabbit might like to eat, provided it’s not toxic or harmful to him, should only be fed as an occasional treat and not as a part of his main diet. It’s equally important to limit his pellet intake while providing plenty of hay at all times and enough fresh vegetables. We recommend the Oxbow Bunny Basics/T pellets as it is a high-quality blend and doesn’t contain unhealthy fillers like a lot of the cheaper pellets. For every ‘5 pounds of bunny’ the portion should be 1/8 to 1/4 cup daily. It is also important to keep your bunny’s diet consistent; any changes should be done very gradually. Bunnies should never be given nuts, seeds, ‘human’ treats or sugary things like yogurt drops sold in many pet stores as those are very bad for their health or digestive systems. Avoid pellets with colorful addings. The House Rabbit Society offers a very informative article about DIET. and a LIST OF SUGGESTED VEGETABLES & FRUITS for a Rabbits Diet.